More than a few PC gamers found early agency in the choose-your-own-adventure novels of Fighting Fantasy or, later, Goosebumps. It’s only fitting that we return there now. For those occasions when a Let’s Play is too passive but keyboard and mouse too involved, here’s a brave adaptation of Fallout: New Vegas, entitled Choose Your Own Apocalypse. Looking for the best RPG on PC? We’ve collated the finest. As always, Obsidian’s game begins in bed, with the new knowledge that you’ve just been shot in head and left to die in the desert. But in Many A True Nerd’s YouTube series, you’re then given a simple choice: make a beeline for Las Vegas, despite the dangers, or meander along a safer route via Primm? There’s actually a lot more work involved here than might be apparent from the off. 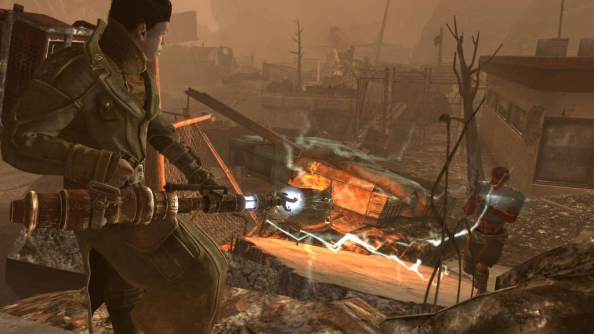 New Vegas isn’t a world of clear binaries, for the most part, but a simulated sandbox of granular shifts and emergent happenings. Nevertheless, using a little artistic license – surely this Stealth Boy has worn off by now? – MaTN’s Jon weaves a pretty convincing narrative. If you decide to participate, you’re better off playing on a desktop – you’ll miss out on the YouTube annotations on mobile.